With smartphones now containing more powerful internal components powering stunning displays, we have seen developers releasing even better gaming titles to the masses. Console quality games are being released all the time with big franchises also becoming available, and now we have a video for you that contains Real Racing 3 game footage of tracks. Back in August Electronic Arts announced Real Racing 3 from their newly formed studio Firemonkeys, and now the team behind the game have whetted the appetite of gamers further by releasing this latest video that can be seen below. This latest video trailer shows us a little more of the in game footage that looks stunning, and it also gives gamers a sneak look behind the scenes at the team creating a new track for the game from the ground up. The game was shown off back in September at the Apple iPhone 5 keynote speech, and was thought set to be released by the end of 2012, but obviously missed this timeframe. Once released the game will allow users to race against friends as well as other players across the globe. 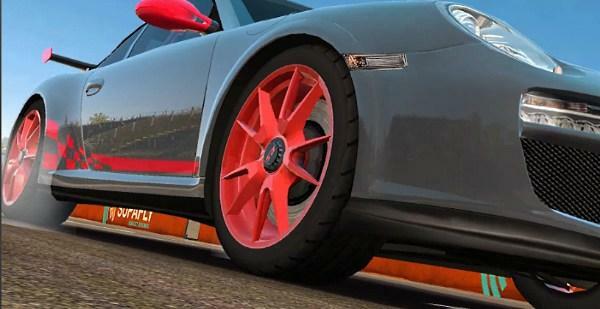 Racing will take place on real circuits using licensed cars from manufacturers such as Audi, Dodge, and Porsche with a number of enhancements in the game from the previous title in the franchise. Real racing 3 will feature the most realistic graphics to date along with players being able to customize the vehicles, and much more. As iMore.com are reporting the video shows the team develop a track from their own area namely, Melbourne Australia, and the track they came up with isn’t built on any real life track, but instead the back streets of the city. The game is expected to hit the App Store towards the end of next month, and Android fans should also see the game eventually as Real Racing 2 was launched on iOS before the game eventually found its way to the platform. Check out the video below and tell us if you are looking forward to Real Racing 3.